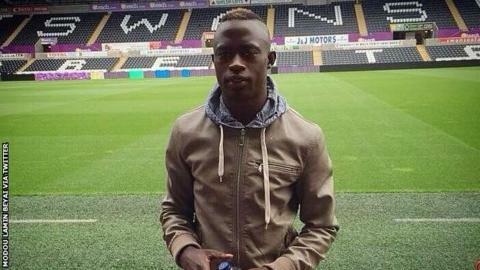 Gambian striker Modou Barrow scored on his debut for Swansea Under-21s only hours after signing from Ostersunds. The 21-year-old completed his move from the Swedish second tier side on Monday on a performance-related contract. Barrow went straight into the U21s side and struck the second goal in a 3-2 victory over Birmingham. "I'm pleased for him," coach Chris Llewellyn told the club's website. "We didn't receive the international clearance until late afternoon." After completing his transfer, Barrow said: "I'm delighted to be here. I now can't wait to get going and improve each day in training and try to score some goals. "I like the way Swansea play football, it reminds me of how I used to play back home. I've watched a lot of their games on TV and I was impressed with what I saw. "They like to give young players a chance and hopefully I can progress here." Barrow was born in Gambia and moved to Sweden as a youngster. He scored 10 goals in 19 appearances for Ostersunds last season.